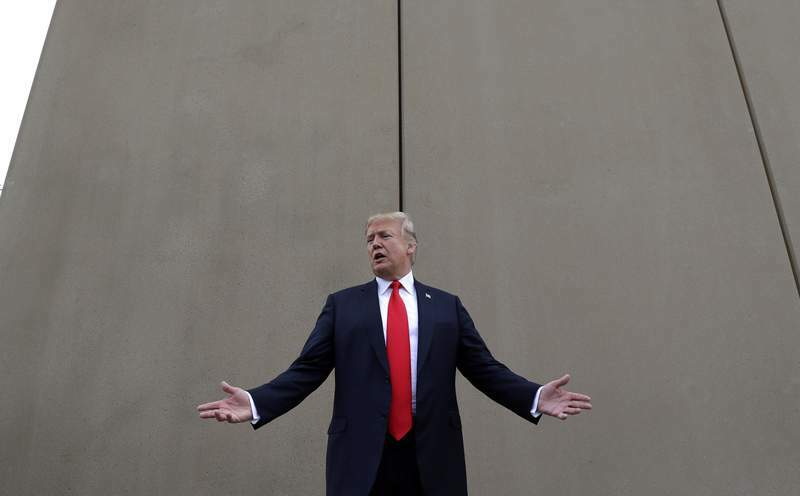 WASHINGTON – President Donald Trump is trumpeting the start of his U.S.-Mexico border wall, but no new work on it is underway. Photos he sent with his tweet last week showed the continuation of an old project to replace 2 miles of existing barrier. Also in recent days, he lambasted Amazon with a questionable claim that its contract with the post office is a "scam" and offered a subpar civics lesson in citing Republican control of the Supreme Court, an unelected branch. Meanwhile, former Veterans Affairs Secretary David Shulkin, whom Trump dismissed unceremoniously in a tweet last week, sidestepped the truth in asserting that his ethics problems were all about politics. TRUMP: "Great briefing this afternoon on the start of our Southern Border WALL!" — tweet Wednesday, showing photos of workers building a fence. TRUMP: "We're going to be starting work, literally, on Monday, on not only some new wall -- not enough, but we're working that very quickly -- but also fixing existing walls and existing acceptable fences." — Trump, speaking the previous week after signing a bill financing the government. THE FACTS: Trump's wrong. No new work began on Monday or any other time last week. And the photos Trump tweeted were misleading. They showed work that's been going on for more than a month on a small border wall replacement project in Calexico, California, that has nothing to do with the federal budget he signed into law last week. The Calexico project that began Feb. 21 to replace a little more than 2 miles (3.2 kilometers) of border wall was financed during the 2017 budget year. A barrier built in the 1990s mainly from recycled metal scraps is being torn down and replaced with bollard-style barriers that are 30 feet (9.1 meters) high. 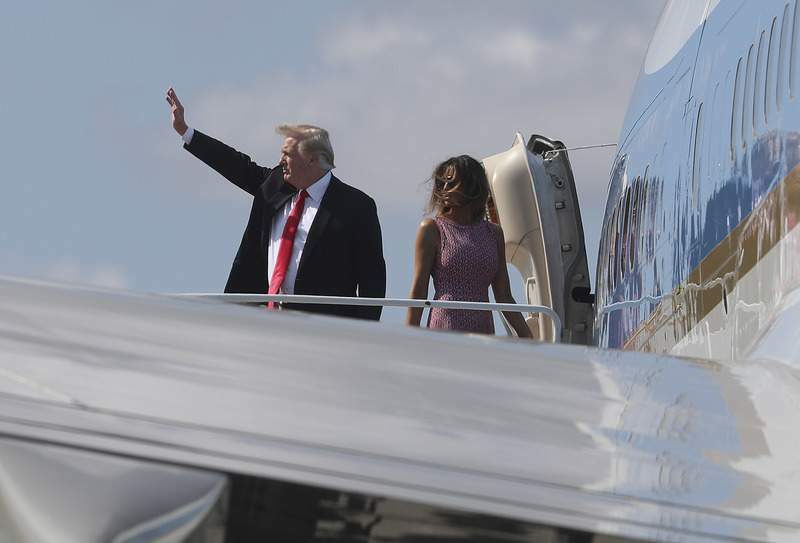 Ronald D. Vitiello, acting deputy commissioner of U.S. Customs and Border Protection, defended the president's statements, saying Friday "there's construction" underway. SHULKIN, defending himself against ethics accusations that contributed to his firing: "I have been really clear. Everything that I did was done properly. It was preapproved by our ethics team. ...I think what the IG found was that a staff member had made essentially some problems in the way that they put the paperwork through. But the IG said I had no knowledge of that." — ABC interview Sunday. THE FACTS: Shulkin grossly misrepresents a report by the VA's inspector general that concluded he had violated ethics rules during an 11-day trip to Europe in July. The watchdog office determined Shulkin had improperly accepted free Wimbledon tennis tickets and failed to consult with VA ethics counsel beforehand. According to the February report, Shulkin belatedly asked VA counsel to expedite an ethics review of his acceptance of the tickets in September — two months after the trip — upon learning that journalists were making inquiries. The inspector general also concluded that Shulkin's chief of staff, Vivieca Wright Simpson, had lied to ethics officials by falsely claiming he was receiving an award in Europe to justify his wife's free travel at taxpayer expense — and doctoring emails to back up her claim. While the VA watchdog "found no evidence" that Shulkin was aware of his staffer's actions, Shulkin understates the extent of Simpson's deception to justify the free trip and his own actions abroad. SHULKIN, citing reasons Trump fired him as Veterans Affairs secretary: "I have been falsely accused of things by people who wanted me out of the way. But despite these politically based attacks on me and my family's character, I am proud of my record and know that I acted with the utmost integrity." — op-ed Thursday in The New York Times. THE FACTS: His statement that he and his family were subjected to politically based attacks is disingenuous, though politics contributed to his dismissal. White House support for Shulkin eroded after the blistering report in February by VA's internal watchdog, a nonpartisan office, about his travels in Europe. It is true, though, that Shulkin had encountered resistance from about a half-dozen political appointees at the VA and White House who rebelled against him. In an extraordinary telephone call, top communications aide John Ullyot and VA spokesman Curt Cashour asked the Republican staff director of the House Veterans Affairs Committee to push for Shulkin's removal after the release of the inspector general's report. The staff director declined to do so. Those political appointees were not involved in drafting the inspector general's report. Shulkin expressed regret for the "distractions" caused by the report and agreed to pay more than $4,000 to cover the costs of his wife's coach airfare and the Wimbledon tickets. He continues to insist he did nothing wrong and points to what his staff did in doctoring his emails as a "mistake." TRUMP: "If the P.O. 'increased its parcel rates, Amazon's shipping costs would rise by $2.6 Billion.' This Post Office scam must stop. Amazon must pay real costs (and taxes) now!" — tweet Saturday. TRUMP: "I have stated my concerns with Amazon long before the Election. Unlike others, they pay little or no taxes to state & local governments, use our Postal System as their Delivery Boy (causing tremendous loss to the U.S.), and are putting many thousands of retailers out of business!" — tweet Thursday. THE FACTS: Trump is misrepresenting Amazon's record on taxes, the U.S. Postal Service's financial situation and the contract that has the post office deliver some Amazon orders. Federal regulators have found that contract to be profitable for the Postal Service. People who buy products sold by Amazon pay sales tax in all states that have a sales tax. Not all third-party vendors using Amazon collect it, however. As for the post office, package delivery has been a bright spot for a service that's lost money for 11 straight years. The losses are mostly due to pension and health care costs — not the business deal for the Postal Service to deliver packages for Amazon. Boosted by e-commerce, the Postal Service has enjoyed double-digit increases in revenue from delivering packages, but that hasn't been enough to offset declines in first-class letters and marketing mail, which together make up more than two-thirds of postal revenue. While the Postal Service's losses can't be attributed to its package business, Trump's claim that it could get more bang for its buck may not be entirely far-fetched. A 2017 analysis by Citigroup concluded that the Postal Service was charging below-market rates as a whole for parcels. The post office does not use taxpayer money for its operations. Trump is upset about Amazon because its owner, Jeff Bezos, owns The Washington Post, one of the targets of his "fake news" tweets. TRUMP: "Because of the $700 & $716 Billion Dollars gotten to rebuild our Military, many jobs are created and our Military is again rich. Building a great Border Wall, with drugs (poison) and enemy combatants pouring into our Country, is all about National Defense. Build WALL through M!" — tweet March 26. THE FACTS: Trump is floating the idea of using "M'' — the Pentagon's military budget — to pay for his wall with Mexico. Such a move would almost certainly require approval from Congress and there's plenty of reason to be skeptical about the notion of diverting military money for this purpose. Only Congress has the power under the Constitution to determine federal appropriations, leaving the Trump administration little authority to shift money without lawmakers' approval. Pentagon spokesman Chris Sherwood referred all questions on the wall to the White House. Spokeswoman Sarah Huckabee Sanders declined to reveal specifics but said Trump would work with the White House counsel to make sure any action taken was within his executive authority. TRUMP: "THE SECOND AMENDMENT WILL NEVER BE REPEALED! As much as Democrats would like to see this happen, and despite the words yesterday of former Supreme Court Justice Stevens, NO WAY. We need more Republicans in 2018 and must ALWAYS hold the Supreme Court!" — tweet Wednesday. THE FACTS: As a basics civics lesson, Trump's tweet falls short. The Supreme Court is the unelected branch of government and no party can "hold" it. That said, both parties try to win confirmation of justices who are considered likely to vote the way they want. Republican-nominated justices have formed a majority of the Supreme Court for nearly 50 years. The five more conservative justices were appointed by Republicans while the four more liberal justices were Democratic nominees. Republicans would have the opportunity to cement ideological balance in their favor if Justice Anthony Kennedy — the most moderate of the conservatives — or one of the older and more liberal justices were to retire with Trump in office and Republicans in control of the Senate. Trump was citing retired Justice John Paul Stevens, who called in a New York Times article for repeal of the Second Amendment to allow for gun control legislation. Democratic leaders are not proposing repeal of the amendment, as Trump implies. Also noteworthy: Stevens was nominated by a Republican president, Gerald Ford. Associated Press writers Mark Sherman and Cal Woodward in Washington and Elliot Spagat in San Diego contributed to this report.